Engineered in Australia specifically for large shade sail structures and extreme conditions, Commercial Heavy 430 is suitable for a wide range of applications from car parks to outdoor recreation areas. 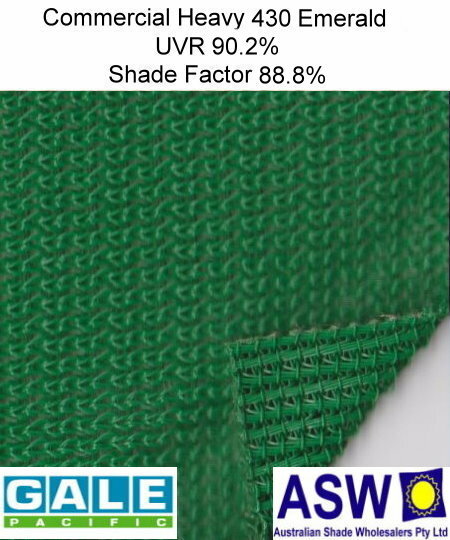 With unparalleled biaxial strength and load carrying capacity, its monofilament yarns and patent pending intertwining knit pattern ensures that your shade structure will retain its design shape over time. It offers the ultimate combination of maximum sun protection, strength and durability to ensure maintenance-free long-life performance. Each colour in the range has been engineered to meet a minimum shade factor of 90% and has been independently tested up to a factor of 94.9%. The fabric is designed to be long lasting under extreme Australian UV exposure.